The API documentation can be found here. If you are interested in the story behind CLUnit you can find it here. For this tutorial we will write a unit test for our hypothetical number crunching library. Our unit test contains four test suites and five test cases. The image below gives a visual representation of our test hierarchy. To create the test suite hierarchy shown in the image we use the following code. ;; Test suite for all number operation tests. ;; Test suite for integer operations. ; Test suite for boolean operations on numbers. 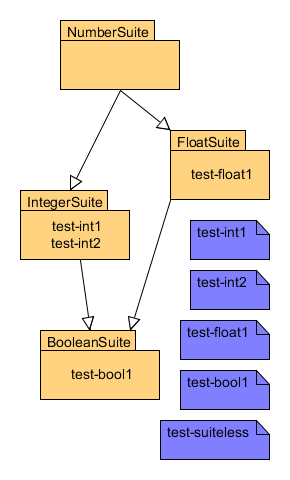 Next we define two test cases for our FloatSuite and IntegerSuite test suites. Each test contains two assertion forms. ASSERT-TRUE considers the assertion a pass if the expression supplied to it returns true and (ASSERT-EQUALITY value expression) considers the assertion to have passed if (FUNCALL clunit:*clunit-equality-test* value expression) returns true. To run an individual test you use the form (RUN-TEST 'test-name), however we are interested in running the entire test suite so we shall use the form (RUN-SUITE 'test-name). The functions RUN-SUITE and RUN-TEST by default print out the test progress as they execute. The function RUN-SUITE first executes the tests referred to by the test suite argument. After executing the test cases, it then executes the child test suites. This process is repeated recursively until all the test cases and test suites in the hierarchy have been executed. During the test progress, the names of test suites and test cases are printed using a visual format that shows how the hierarchy is nested. Each assertion in a test case prints either . for a pass or F for a failure. An E is printed when an error occurs in the test, when an E is seen it means there is a serious problem in your code and the rest of the test case is skipped. CLUnit provides a convenient function (RERUN-FAILED-TESTS) for rerunning only the tests that failed the last time. When the failed tests are fixed, you do the normal run to make sure all tests pass. The functions RUN-SUITE and RUN-TEST return a CLUNIT-REPORT object, the default PRINT-OBJECT method prints the aggregated details of the unit test failures and a test summary. The variable clunit:*clunit-report-format* controls the output format of the unit test results. Possible values are :default, :tap or NIL. The value :tap sets the reporting to TAP output. If the assertion fails the form and its value is printed. However, if the form is a string only the value is printed so this can be used to insert comments into the diagnostic output. This assertion is meant to fail. The functions RUN-SUITE and RUN-TEST accept another keyword argument called :use-debugger. If this argument is set to true, the unit test will fall into the debugger if an assesrtion fails. 0: [CONTINUE                  ] Continue with TEST-INT1 test. 1: [CONTINUE-WITHOUT-DEBUGGING] Continue unit test without interactive debugging. 2: [SKIP-ASSERTION            ] Skip assertion in test TEST-INT1. 3:                              Continue unit test without interactive debugging. 4: [SKIP-TEST                 ] Skip test TEST-INT1. 5: [SKIP-SUITE                ] Skip test suite INTEGERSUITE. 6:                              Skip test suite NUMBERSUITE. 7: [CANCEL-UNIT-TEST          ] Cancel unit test execution. 8: [ABORT                     ] Exit debugger, returning to top level. Fixtures are used in unit tests to setup a consistent context/enviroment in which tests can be executed so that results are reproducible. CLUnit allows you to define fixtures for each test suite. The form (deffixture suite (plug) . body) defines a code template that is wrapped around the code of each test case and test suite that are executed by that test suite at runtime. The test case body is plugged into the template at the position identified by PLUG. Fixtures are expanded at runtime, so the fixture that will wrap around a test depends on the test suite call stack. This test is meant to fail. CLUnit provides an easy way of short circuiting a unit test. The functions RUN-SUITE and RUN-TEST accept another keyword argument called :stop-on-fail. If this argument is set to true, the rest of the unit test is cancelled when any assertion fails or an error occurs. Since the execution of tests is unordered, what we need is a way of specifying that one test depends on another test passing. CLUnit provides a way of doing this via the DEFTEST macro. ;; and with no dependencies. ;; Define a test case associated with test suites: suite1 ... suiteN. ;; that depends on tests: test1 ... testN. A test case with dependencies will be queued until all the test cases it depends on have been run. If all the test cases pass the queued test is executed otherwise its skipped. ;; TEST-MULT1 depends on TEST-MULT0. ;; TEST-ADD1 depends on TEST-MULT1. TEST-MULT1: This is a forced fail by :DERP. Thats all there is to it, so happy hacking!! !